Paradise Inn is a historic hotel built in 1916 at 5,400 feet on the south slope of Mount Rainier in Mount Rainier National Park in Washington. The inn is named after Paradise, the area on the mountain it is located. The 1966 Henry M. Jackson Visitor Center and the 1920 Paradise Guide House are also at this location. The inn and guide house are where many climbers start their ascent of the mountain. The inn is listed in the National Register of Historic Places. Step outside the historic Paradise Inn accommodations and be welcomed by the site of meadows in full bloom, miles of trails that lead to adventures in all directions and explore the outdoors the way it was meant to be, free from modern life stresses and distractions. Stand in awe of Nisqually Glacier and head out to the Longmire Museum or the visitor centers at Ohanopecosh, Sunrise and Paradise for more information and displays of the areas rich history. The inn was designed by Frederick Heath of Heath, Gove & Bell in 1915. 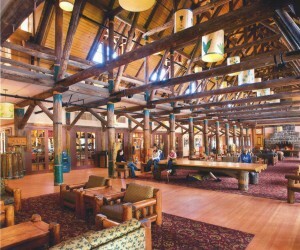 It was initially planned to be built at Longmire. The National Park Service moved the planned location to Paradise when the original financier, John Reese, backed away from the project. 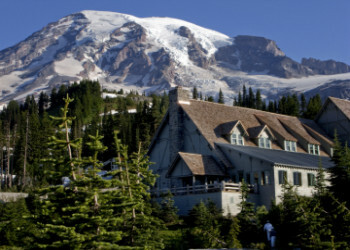 The inn was built by the Rainier National Park Company, founded by Steven T. Mather, assistant to the Secretary of the Interior. Native building materials were used including cedar shingles, native rock and weathered timbers salvaged from a fire in 1885. After 30 years of aging the timbers had developed an unusual silver sheen. The original plan called for a red roof but the Park Service vetoed this in favor of a green roof which blended in with the natural environment. This is in keeping with the National Park Service Rustic style of architecture. The inn opened on July 1, 1917 and cost between $90,000 and $100,000. The lodge is built with exposed cedar logs that provide its structural framework. It includes French doors in 14 bays to "allow summer breezes to enter" and domer windows for natural lightubg to enter on the second story, "augmented by hanging lamps". Mount Rainier National Park is located in southeast Pierce County and northeast Lewis County in Washington state. It was established on 2 March 1899, the fifth national park in the United States. The park contains 368 square miles including all of Mount Rainier, a 14,411-foot stratovolcano. The mountain rises abruptly from the surrounding land with elevations in the park ranging from 1,600 feet to over 14,000 feet. The highest point in the Cascade Range, around it are valleys, waterfalls, subalpine wildflower meadows, old growth forest and more than 26 glaciers. The volcano is often shrouded in clouds that dump enormous amounts of rain and snow on the peak every year and hide it from the crowds that head to the park on weekends.